We've got several violas blooming in the solarium. We started these as seedlings a few months ago and they are one of the few plants that were able to grow well with the low light conditions of a Montana winter. Next winter I think I'm going to hang some pots of violas and force some flowering bulbs as well. We started a few seeds this week. This is probably a bit crazy considering its January 30 and our last frost date is around June 1. However, we're going to get them going inside the heated part of our house under florescent bulbs. Once they are tolerant of a bit more cold, we can move the seedlings out into the solarium to get some real sun and harden up a bit. Once the seedlings outgrow that, we will move some things into the greenhouse to stay, and some to wait in beds for the threat of frost to leave. That, or we'll have our raised beds with hoops/plastic up and can plant the seedlings outside. We started some leeks, sweet peas (I love those), onions, shallots, tomatoes, and peppers. We are planning to grow half of our tomatoes and peppers this year in the greenhouse to see just how far we can extend our growing season. We may also pot up a couple plants to put in the solarium. We'll plant some more seeds again in 4-8 weeks when everyone else conventionally gets started just to hedge our bets in case our experiment doesn't work. I don't have any grow lights so I'm not quite at the seed-starting phase of the year yet. Your johnny-jump-ups look very happy. Makes me want to get a move on with my seeds. Hurry up, sun! Speaking of grow lights... we were shocked to find florescent light fixtures for very cheap at our hardware store. They were only $12 for a 4-ft long fixture. The woman at the store told us that just a regular florescent light bulb would work as well as a special "grow" bulb, so that's what we're doing. I'll post a picture of what we get rigged up on Monday for the flats of seeds. 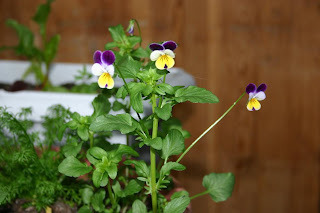 I love the violas, I wonder if some of the larger flowering types would do well in your solarium next year. The addition of some bulbs will really brighten up some dreary winter days. I used regular florescent bulbs last year and I agree, the plants did fine, just a little leggy when I moved the light too far from some. What worked better however was starting some seeds in a cold frame. They were started later and caught up quickly with the plants inside the house. I planted both and did not find a difference once in the garden. Violas are one of the mainstays of our garden. A good friend gave me plants ten years ago and they still come up EVERYWHERE, which I love! I throw the blossoms in salads and press them as well. Thanks for following me. I am happy to find your blog, it is wonderful reading.